Jewish Family & Career Services held its annual Community of Caring luncheon March 17 following its annual meeting. JF&CS leaders Jeff Alperin and Faye Dresner speak at the Community of Caring luncheon. 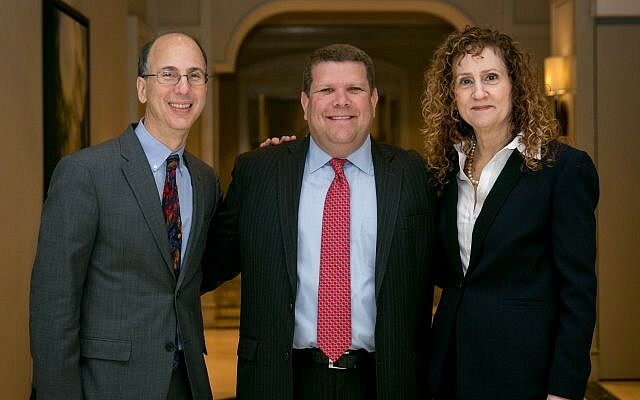 Jeff Alperin, Michael Levy and Faye Dresner are among the JF&CS leaders at the event. JF&CS holds its Community of Caring luncheon at the Grand Hyatt hotel. Jewish Family & Career Services held its annual Community of Caring luncheon March 17 following its annual meeting. During the event, board and staff thanked outgoing president Michael Levy for his two years of service, including a special tribute from Levy’s rabbi, Congregation Etz Chaim’s Daniel Dorsch. New president Jeff Alperin was installed as well as the new board of directors. The volunteer of the year award went to Jodi Weintraub for her years of dedicated service to the agency. The staff award went to reception manager Danijela Pecanac. The Community of Caring lunch was hosted by Vanessa and Isaac Frank and Alperin. 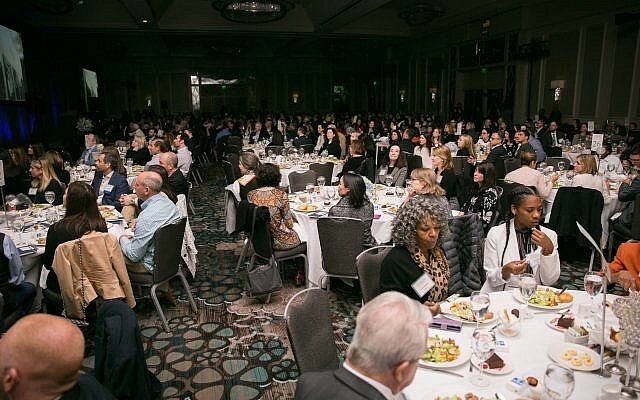 More than 500 attendees filled the ballroom at the Grand Hyatt Atlanta in Buckhead, where guests watched four moving stories of impact. 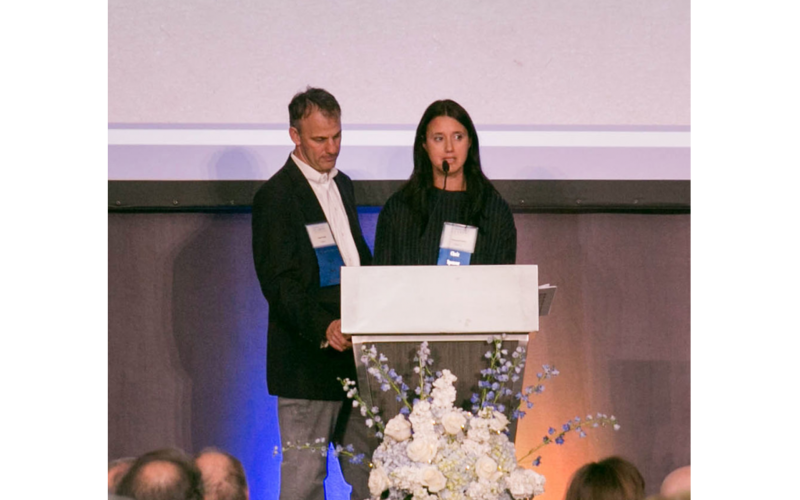 Hosting the luncheon were Vanessa and Isaac Frank, along with Jeff Alperin. Philip’s Journey: A salesman finds himself at the age of 40 homeless and an alcoholic, and eventually is sent to prison, where he loses his teeth in an attack. Thanks to the great work of the Ben Massell Dental Clinic and its all-volunteer professional dentists, he is able to completely transform his life, and after getting dentures and his smile back, returns to school and starts a new career in finance at a car dealership. Philip now dreams of helping others and becoming a major donor. 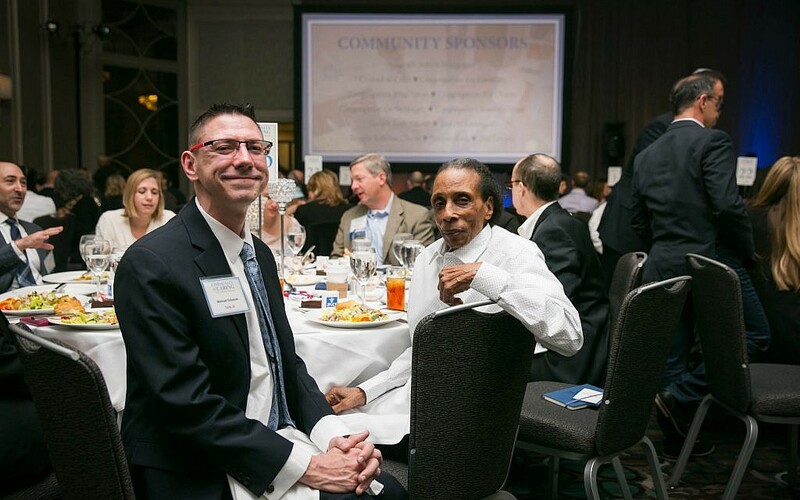 Michael Osborne and Curtis Bynum enjoy the luncheon. 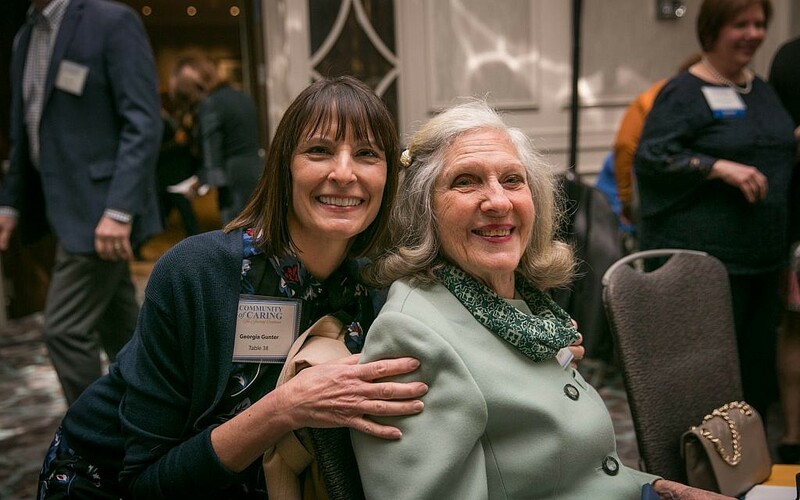 Chaplaincy Journey: This eye-opening video shared the work of JF&CS Community Chaplain Rabbi Judith Beiner and her Bikur Cholim volunteers as they “spread Jewish sunshine” to senior living facilities and area hospitals. In the story, Rabbi Beiner comforts Anna Teper, a client of the agency, in her hospital bed as part of her weekly visits to Jewish patients at St. Joseph’s Hospital. The story also sheds light on a little-known program that JF&CS provides. With the help of Dressler’s Jewish Funeral Care, JF&CS is able to provide a Jewish burial for members of our community who cannot afford it. Georgia Gunter and Anita Beckman are among those in attendance. 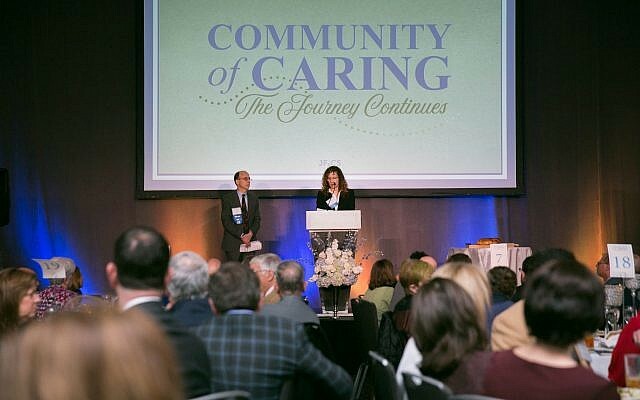 The Community of Caring event kicked off the JF&CS annual campaign and brought in $276,366. Next for JF&CS is the 20th Anniversary of the Tasting, Thursday, May 16, at The Stave Room. To view JF&CS’ impact videos, click here.